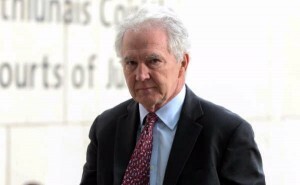 Gardai were not involved in the drafting of witness statements criticised by a trial judge in the prosecution of former Anglo Irish Bank chairman Sean FitzPatrick, a court has heard. Lawyers for Mr FitzPatrick (68), who is accused of misleading auditors about multi-million euro loans, have previously said that statements from witnesses from the auditors were produced as a result of coaching and cross-contamination between witnesses. Earlier this week the jury heard that the practices used by investigators from the Office of Director of Corporate Enforcement (ODCE) were found to be “unlawful” by Judge Mary Ellen Ring during the first trial in May 2015. On day 73 of the trial in Dublin Circuit Criminal Court, the jury was shown a letter written by Detective Superintendent Gerard Walsh in June 2015 relating to the adjournment of that trial. In the email, which accompanies a report made by Detective Inspector Raymond Kavanagh, Superintendent Walsh states that “the garda unit seconded to the ODCE were not involved in drafting of the witness statements the subject of courts criticism”. The email requested that the attached report be forwarded to garda management. Kevin O’Connell, a lead investigator who had admitted his involvement in wrong and inappropriate practices, told the jury that Dt Inspector Kavanagh was present during a meeting in December 2010 where drafting of statements had taken place. At this time DI Kavanagh had just recently taken on the seconded role with the ODCE, he said. Mr O’Connell has also previously admitted shredding documents which were relevant to the investigation. Today he told the jury that he discovered the documents on a Friday evening after he had spent four days under cross-examination over the drafting of the statements during the first trial. Earlier that same day he had discovered 16 pages relevant to the investigation. He brought these to the attention of the director of corporate enforcement Ian Drennan and the documents were scanned and emailed to the DPP. Henry Matthews, an officer with the DPP, then told Mr O’Connell that the late discovery of relevant documents was unfortunate and most unhelpful and that he would have to go back into the witness box to account for it. He told Mr Condon that he was terrified about the prospect of having to get back into the witness box and undergo further cross-examination. He said the elation he had felt after finishing his evidence turned to panic. A short time late he discovered four more documents related to EY (formerly Ernst & Young), Anglo’s auditors from 2002 to 2008. He said his panic grew and he decided to shred the documents. “It was a completely wrong thing to do. I’m ashamed of it. I have never done anything like it before nor I hope will I ever again. “It was a time of very considerable pressure. I made a desperate, desperate mistake. I was aware of what they were, that further heightened the panic I was in. “It was a time of enormous strain, more so than I’d ever experienced in my professional career before,” Mr O’Connell said. He said that over the weekend he despaired and agonised over his actions and realised he could not maintain the lie. He said without prompting from anyone else he rang his boss Ian Drennan and told him what had happened. “All I can be grateful for is, 48 hours later, I did the right thing in admitting the wrong thing that I had done. I’m glad I did,” he said. The jury was shown CCTV footage from the ODCE offices showing Mr O’Connell bringing a tray of documents from his office to a shredding room. A colleague, Garda Gary Callinan, approached Mr O’Connell at this time and Mr O’Connell can be seen attempting to conceal the documents while the two men talk. Mr Condon pointed out that around half an hour earlier Garda Callinan had been in Mr O’Connell’s office “shooting the breeze” and having a social conversation. Mr O’Connell agreed that he had the documents at this point and did not disclose it to his “trusted colleague”. He said that “the train had already left the station” and his mind was made up to destroy the documents. “Another grave error on my part. I regret I didn’t tell him,” Mr O’Connell said. Garda Callinan previously testified that it was a normal conversation and he didn’t notice anything unusual about Mr O’Connell, the court heard. Mr O’Connell told the court that his decision to destroy the documents was unethical. Mr Condon described it “an absolute disgrace”, saying: “it was without doubt a truly appalling thing for a State investigator, given the powers available to you”. Mr FitzPatrick of Whitshed Road, Greystones, Co Wicklow has pleaded not guilty to 27 offences under the 1990 Companies Act. These include 22 charges of making a misleading, false or deceptive statement to auditors and five charges of furnishing false information in the years 2002 to 2007. In other evidence the jury heard that a statement given by a witness for the prosecution was changed during a meeting the witness wasn’t present for. The jury were shown more drafts of what would eventually become the witness statement of Vincent Bergin, the audit manager for Anglo. The change was detailed in an ODCE internal email dated December 5, 2010, weeks after the ODCE had received a first draft of the statement from EY’s lawyers, A&L Goodbody. In the subsequent weeks the ODCE produced their own version of the statement which included suggestions for additional paragraphs and for deleting sections. Mr O’Connell noted that the lawyers have taken on board most of the suggested changes. He said that “most crucially” they changed what he said was a “rather weak statement” to one which includes the words: “from my perspective as the auditor receiving the letters… I believe the letters were misleading, false or deceptive in a material particular”. Mr Condon said it was a piece of brazenness for Mr O’Connell to presenting this change as theirs when he was in the room when it was agreed at a meeting with EY’s lawyers. He said that the “I” in the statement, Mr Bergin, wasn’t in the room. “His solicitor was typing out the wording which would be agreed with the ODCE,” counsel said. Mr O’Connell replied that he believed that the wording would ultimately only appear in the final statement of Mr Bergin if Mr Bergin was willing to adopt the wording. “If he had any issues to that wording he would not have signed up to it,” he said. In an email sent in November to Mr O’Connell and referring to the “tidying up” of the statement, Liam Kennedy, partner with A&L Goodbody, states: “My client may simultaneously be doing some polishing”.